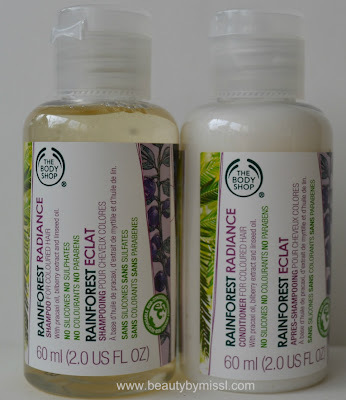 I bought The Body Shop Rainforest Radiance Shampoo & Conditioner in travel size in July. 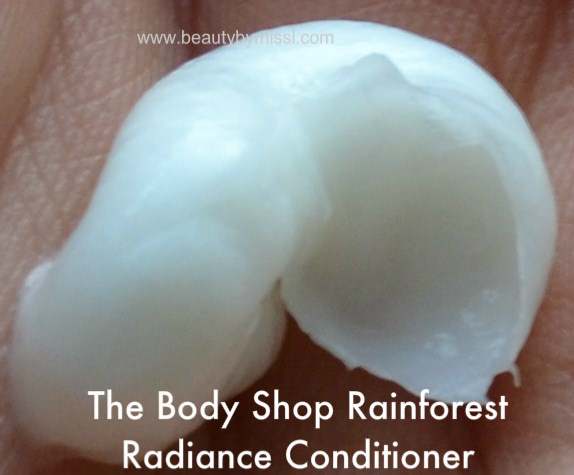 Rainforest Radiance products are meant for coloured hair. I have used them 1,5 months and I just LOVE these two products and I am happy that I decided to try them. Rainforest Radiance Shampoo for coloured hair is promised to gently cleanse all the dulling residues for prolonged color radiance. The shampoo contains UV filter, but it is free of parabens, sulphates, silicones and colourants. This shampoo comes in 3 sizes: 60ml, 250ml and 400ml. The small size that I own costs €3.30. The shampoo itself doesn´t have color and it has really delicious blueberry scent. – together with the conditioner gave my hair some body and volume, especially if I used blow dryer. – doesn´t lather as well as some other shampoos, but since it doesn´t contain all those chemicals then it is pretty normal. YES!!! I loved this shampoo. I was bit hesitant at first because some natural shampoos can´t really do anything when you have coloured or highlighted hair and so I wasn´t very sure if this works for my hair. This conditioner is promised to moisturise the hair and protect their color and shine. It doesn´t contain parabens, silicones nor colourants. It also comes in three sizes: 60 ml, 250ml and 400ml. Aqua (Solvent/Diluent), Cetearyl Alcohol (Emulsifier), Glyceryl Stearate (Emulsifier), Distearoylethyl Hydroxyethylmonium Methosulfate (Antistatic Agent), Glycine Soja Oil (Emollient/Skin Conditioner), Polyglyceryl-4 Caprate (Skin-Conditioning Agent), Glycerin (Humectant), Parfum (Fragrance), Sodium Benzoate (Preservative), Sucrose Laurate (Skin-Conditioning Agent), Hydroxypropyl Guar (Emulsion stabilizer, Viscocity increasing agent), Linum Usitatissimum Seed Oil (Fragrance Ingredient), Salicylic Acid (Preservative/Hair Conditioner), Aloe Barbadensis Leaf Juice (Skin Conditioning Agent), Ethylhexyl Methoxycinnamate (Sunscreen), Pentaclethra Macroloba Seed Oil (Skin-Conditioning Agent), Citric Acid (pH Adjuster), Vaccinium Myrtillus Fruit Extract (Skin-Conditioning Agent), Tocopherol (Antioxidant). – with the shampoo, it gave my hair body and volume, especially if I used blow dryer. – it is difficult to get the conditioner out of the bottle (at least from this small 60ml bottle), especially if the bottle is getting empty. Yes I would. I liked the way my hair felt after using it. Have you used these products from The Body Shop or any other The Body Shop hair care products?